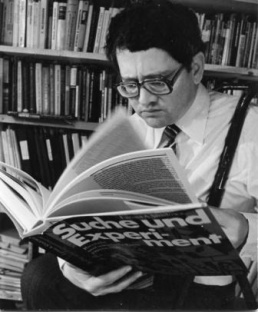 Bulat Galeyev (1940-2009) was a science researcher, artist and long-time director of the Prometei Institute. Born Bulat Maxmudovich Galeyev in 1940. Graduated from Kazan State Pedagogical Institute, Kazan, USSR, in 1962, and received a Ph.D. in 1986. He was a teacher in physics and aesthetics, 1962-1963; a lecturer in physics and philosophy at KAI, Kazan, 1963-1966; a scientific worker, 1966-1994; head of SKB Prometheus, director of scientific and research institute for experimental aesthetics affilated with the Academy of Sciences of Tatarstan and Kazan State Technical University, Kazan, 1994-present; a film director, theatrical performances director, director of light-music performances and video art installations, SKB Prometei, 1964-1995; and professor of aesthetics of Kazan Conservatory, from 1990. Galeyev wrote several books and contributed more than 500 articles to professional journals. He was a member of the editorial board of Leonardo, since 1987; of Language of Design magazine, USA, 1992-1997; and Kazan magazine, from 1993. He had organided fifteen editions of All-Union and All-Russia Light and Music conferences and participated in numerous international symposia and festivals. He received a Diploma for Spectacle from the All-Russia Theatrical Society, Moscow, 1970; a diploma for film awarded by the organizing committee of the international Techfilm festival, Prague, 1975; and an honorary medal awarded by the Ministry of Culture of the USSR, Moscow, 1983. He was a member of Russian Academy of Humanities and of the Russian Cinemamakers Union, as well as a corresponding member ofthe Academy of Sciences of Tatarstan. Member of International Society for Art, Science and Technology. Died in 2009. The Space Dandelion. Electronic interpretation of Kant's and Hegel's philosofic concepts (a series of 12 oscillograms), 1987. Spatial Music [joint edition], 2005.
editor, Synaesthesia: The unity of the senses and synthesis of arts, Kazan: Tupolev KSTU, 2008. "Music-Kinetic Art Medium: On the Work of the Group 'Prometei' (SKB), Kazan, U.S.S.R.", Leonardo 9:3 (1976), pp 177-182. "The Fire of "Prometheus": Music-Kinetic Art Experiments in the USSR", Leonardo 21:4 (1988), pp 383-396. "Modern Laokoön: Esthetic Problems of Synaesthesia Conference, Moscow, USSR, 21-22 January 1991", Leonardo 24:5 (1991), pp 505-507. "Kandinsky and Schoenberg: The Problem of Internal Counterpoint", Languages of Design 1 No. 2, (1993) pp 184-186. "Problem of synaesthesia in the arts", Languages of Design 1 (1993), pp 201-203. "Schoenberg/Kandinsky Symposium and the Academy of Light", Leonardo 27:1 (1994), pp 3-5. "Farewell Prometheus Readings: Light-Music in the Former Soviet Union", Leonardo 27:4 (1994), pp 351-352. Stan Voronin, "Review: Man, Art, Technology: The Problem of Synesthesia in Art by Bulat Galeyev; Light-Music in the System of the Arts by Bulat Galeyev", Leonardo 27:5 (1994) pp 449-450. "Light from an Extinct Star: Music and Technology in the Former Soviet Union", Leonardo 28:1 (1995), pp 51-52.
Review: The International "Ostranenie" Festival, Leonardo 28:1 (1995), pp 78-79. "On the true sources of light-music", Languages of Design 3 (1996), pp 33-44. "Institute "Prometei", Kazan, Russia (1962-1997)" 1997. "Russians Leave Europe", Leonardo 31:2 (1998), pp 142-143. "Light-Music Today: The development of Scriabin's Ideas (on the example of Kazan school of new art)", Transactions of Scriabin Museum, Moscow, 1998, No 3, pp. 52-71. "What is synaesthesia: myth and reality", Leonardo Electronic Almanac 7:6 (1999). "Synaesthesia is not a psychic abnormality". Paper presented at the conference "Language, Vision & Music", August 1999, Galeway, Ireland. "Loftysickness of synesthesia or creative impotence of its interpreters? ", in Conference Prometheus-2000. Collected theses, Kazan: FEN, 2000, pp 73-79. "Mikhail Matyushin's Contribution to Synthetic Art", Leonardo 38:2 (2005), pp 151-154. "The Nature and Functions of Synesthesia in Music", Leonardo 40:3 (2007), pp 285-288. "Periodical System of Art", undated. "Computers and Art: Myths and Reality", undated. "Abstract Cinema and Light-Music", undated. "Sound and Light Performances", undated. "To colour and light (evolution of gravitational synaesthesia inmusic)". Brian Droitcour, "The Prometheus Institute and the Work of Bulat Galeyev", 2009. Jörg Jewanski, "Obituary: Bulat Maxmudovich Galeyev (2 Oct. 1940 - 5 Jan. 2009)", 2009. From Synesthesia to Synthesis of Arts: In Praise of Bulat Galeyev, a conference in Kazan, 2-5 October 2015. This page was last modified on 15 November 2017, at 23:20. This page has been accessed 29,598 times.